You may have wondered about the wall of wrought-iron cages flanking an ornate brass sink at the front of our Bierhall. 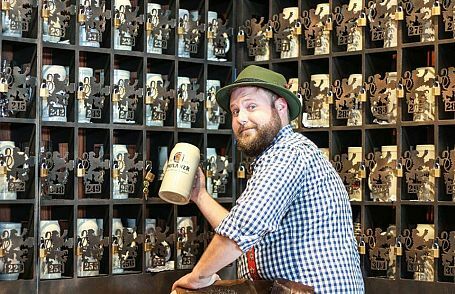 This is where our regular Guests keep their treasured Bier Steins under lock and key. A Stein Club is a traditional feature in many Bierhalls throughout Bavaria. So if live music, fun friends, and great food and drink specials are your thing, we’d love to welcome you into our Stein Club family! For more information Click Here. p.s. Stein Club memberships make a great gift! Please Enter Valid Email address. Please Enter Email address.